Simon Cooke in January 2009. Simon Cooke (born 10 August 1975, Manchester, England, UK) is a British video game developer, writer, and musician. He was Director of Engineering for X-Ray Kid Studios, a cross-media entertainment company, and previously worked for Surreal Software, a subsidiary of Midway Games, as Principal Technology Engineer and Lead Gameplay Engineer on This is Vegas, and as Lead Tools Programmer on The Suffering: Ties That Bind. He is most well known for his work on the SAM Coupé home computer games and demo scene, his monthly column in Your Sinclair magazine, and his work on Xbox as part of the Xbox Advanced Technology Group. He also releases electronic music under the name Fleeting Shadow. Cooke went to secondary school at St. Ambrose College on a scholarship from 1986-1993, then studied Physics with Electronic Engineering at the University of Manchester Institution of Science and Technology. Cooke started to produce demos and software for the SAM Coupé in 1990 at age 15. His first published games including ports of Prince of Persia (1991) to the platform, assisting the primary developer Chris White. He also worked with Chris White on the SAM Coupé videogame Exodus (developed primarily by Neil Holmes and Stuart Leonardi), and parts of Populous (unreleased) and Lemmings (1993). He was responsible for the campaign to design a drop-in replacement for the SAM Coupé primary control processor (ASIC), working with the original hardware designer, Bruce Gordon, and publicized in Your Sinclair magazine. The new ASIC would have improved the capabilities of the computer by adding better sound, graphics and hardware-assisted rendering. It would have cost £50,000 to produce. Cooke's work in the SAM demoscene first came to the forefront when it appeared in issue 12 of FRED, with his sampled-sound Star Trek and Megablast demos. Cooke founded the Entropy demo group in April 1992, under the pseudonym Cookie, and featuring other well-known SAM Coupé programmers and demo-scene producers, musicians and writers such as Nicam (Simon Hindle), Dr. H (Roger Hartley), Lord Blackadder (Luke Trevorrow), Phantom Footballer, Cid, The DVB, Mike AJ, Mike-Boy, Andy Insanity, Geoff Winkless and Kronus. Their most infamous demo was a planned multi-disk project called Statues of Ice, which never shipped. Cooke's journalism career spanned over five years, from 1990 to 1996, when he had been publishing in a variety of internationally published news-stand magazines, including Your Sinclair, .net, Internet & Comms Today, Internet Today, How To Get Online, Net User and arcane. Cooke's first published writing appeared in the SAM Coupé disk magazine FRED, published by Colin Macdonald, where he wrote technical articles, reviews and fiction. Cooke joined Your Sinclair magazine in 1992 while still in secondary school, during the last year of the magazine's life, taking over the Spec Tec Jr technical help column from its previous "Spec Tec", Adam Waring. 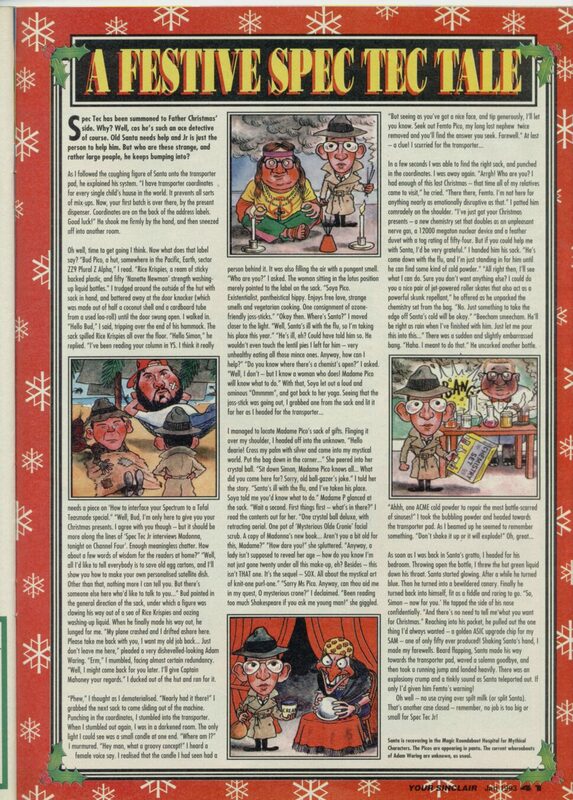 He wrote for the magazine for 11 issues, starting in issue 83, including the Christmas special story in issue 85, before the magazine was discontinued in 1993. In 1996 he published the SAM Coupé technical magazine Based On An Idea... magazine, which was widely regarded as one of the best (if short-lived) technical magazines for that home computer, including articles written by technical luminaries of the SAM Coupe development community. During his time at university, Cooke wrote for a variety of newsstand magazines, focusing on the new-to-the-public phenomenon that was the Internet. His best-known article was published in issue 3 of .net magazine (1994), on the subject of online dating. As a result of this article ("Love Over The Wires"), he appeared on the BBC Open University radio program, Virtuous Maths, to talk about the subject of online dating. The program was recorded in a singles bar in the south end of London. Further coverage on his article also appeared in The Daily Mail in 1995 although the article was factually inaccurate. He wrote for a variety of magazines published by Paragon Publishing, including a regular column in Internet & Comms Today magazine on FidoNet, taking over for the original columnist John Kennedy, as well as many feature articles in the magazine over the span of several years. Other Paragon magazines he wrote for included Net User, and How To Get Online. His article Rumour Control regarding the Communications Decency Act of 1996 was used to help shape Internet policy in the British House of Commons (as part of the Labor Government's Internet Task Force), and also was sent to several congressmen in the United States Government. Several of his articles on the early rise of the Internet as a medium outside of academia (i.e. after the Eternal September when it became available to the masses) have been used as course materials by sociology courses in several universities, including Queen's University Belfast. Tutorials he wrote for How To Get Online magazine were handed out to first year college students at Queen's University, Australia. In 1994 his encapsulation of the characteristics of the Internet was selected by the BBC in a UK competition, and was used for several years by the British Government's National Council for Education in Technology. The Net is possibly the largest store of information on this planet. Everybody can be part of it; it is one of the few places where race, creed, colour, gender, sexual preference do not prejudice people against others. All this through the magic of modern technology. Communication is the key. People talking to people. The Net isn't computers. That's just the way we access it. The Net is people helping each other in a worldwide community. In 2001, he co-founded Popcorn Films with former co-workers at Sierra Online, and to date has been involved in the production of two short films, The Good Samaritan and Finn's Last Dance. His unproduced screenplay Unsealed was the highest-rated short screenplay for February 2008 on Francis Ford Coppola's Zoetrope.com writing website. Cooke was Director of Engineering for X-Ray Kid Studios, a cross-media entertainment company, and previously worked for Surreal Software, a subsidiary of Midway Games, as Principal Technology Engineer and Lead Gameplay Engineer on This is Vegas, and as Lead Tools Programmer on The Suffering: Ties That Bind. He joined Microsoft in 2009 working on Xbox 360 and Kinect as part of the Xbox Advanced Technology Group. Cooke has over the years performed his own research into areas of neurobiology and biochemistry, publishing them on his blog. The most notable of these include hangover cures and cures for "the spins" - another common result of drinking, which can be alleviated by tilting one's head such that it is below vertical. He has also performed research into why videogames look better at 60 Hz or higher - the reason being that the eye wobbles at approximately 85 Hz, allowing it to supersample visual imagery at greater accuracy than simple optics should allow (by the Rayleigh criterion). Inventor of the Bip Buffer Circular buffer data structure used in Google's Android OS. ^ "Statues of Ice | World Of Sam". www.worldofsam.org. Retrieved 4 January 2016. ^ "Joystick Jugglers". www.ysrnry.co.uk. Retrieved 4 January 2016. ^ "I Was A Live Action Roleplaying Virgin..." simoncooke.com. Retrieved 31 December 2015. ^ Cooke, Simon (December 1996). "I Was A Live Action Roleplaying Virgin...". arcane magazine. No. 13. Future plc. ^ "Journalism History". simoncooke.com. Retrieved 4 January 2016. ^ "Based On An Idea... | World Of Sam". www.worldofsam.org. Retrieved 31 December 2015. ^ "Virtuous Maths: Chastity". Open University. 30 April 1995. BBC. BBC Radio Four. ^ Campbell, Clare (24 April 1995). "Can You Find Love on the Internet?". The Daily Mail. ^ "Rumour Control - Internet and Comms Today Issue 8". simoncooke.com. Retrieved 31 December 2015. ^ Communicating Britain's Future. Great Britain: The Labour Party. 1995. ^ "Journalism History". simoncooke.com. Retrieved 30 December 2015. ^ "A Look to the Future — Some Terms and Concepts | lwebs.ca". www.lwebs.ca. Archived from the original on 14 April 2015. Retrieved 31 December 2015. ^ Highways for Learning: a Guide to the Internet for Schools and Colleges. Coventry, United Kingdom: National Council for Educational Technology (NCET). 1996. ISBN 9781853793189. ^ "latest news - Popcorn Films". www.popcornfilms.com. Retrieved 30 December 2015. ^ "Update: Unsealed on Zoetrope.com". Accidental Scientist. Retrieved 31 December 2015. ^ "The Bip Buffer - The Circular Buffer with a Twist - CodeProject". www.codeproject.com. Retrieved 31 December 2015. This page was last edited on 3 March 2019, at 14:56 (UTC).